Mt. Calvary Cemetery is a Catholic cemetery that is part of St. Joseph Weare Parish, which includes St. Vincent Church. Any registered member (or family member) of the parish may be buried in Mt. Calvary. Others may be buried in the Cemetery, subject to availability of plots. The family of the deceased is responsible for providing to the sexton, documentation showing ownership of the plot before a grave wil be opened on that plot. Burial fees: Burial fees include opening and closing the grave for casket or cremains. Headstones: The monument company from which the headstone is purchased will arrange for setting of the stone and foundation pad (if needed). In general, headstones are to be 36” long by 24” high. watering or maintaining plants and flowers in the urns. In October of each year, all urns are emptied and turned upside down by groundskeepers, and contents of the urns are disposed of. Maximum speed is 5 M.P.H. Trees, shrubs, or flowers shall not be planted outside of urns. All urns must have a liner. Nestled among fields and orchards, Mt. Calvary Cemetery is located directly behind St. Joseph’s Catholic Church. Mt. 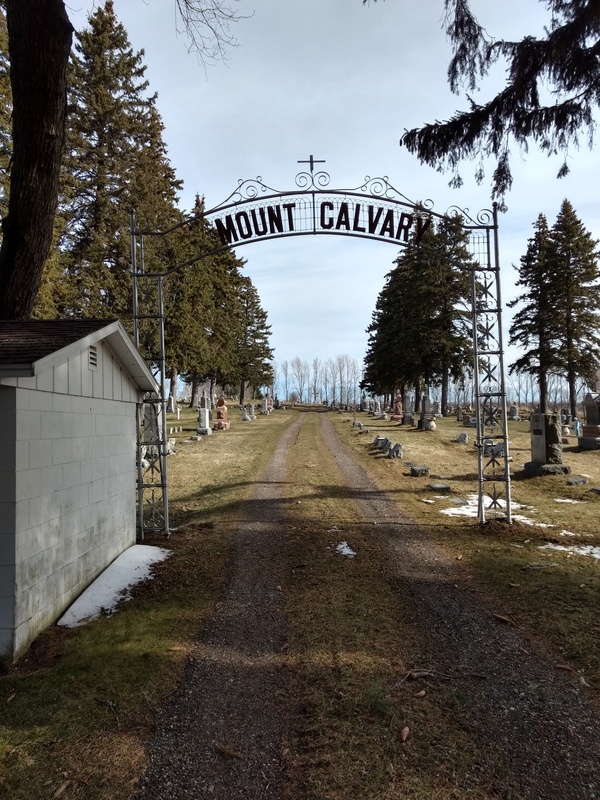 Calvary Cemetery is known for its peaceful beauty and is well loved by our community. Sadly, in August 2018, a wind storm blew through and destroyed our beautiful pine trees that were over 100 years old. The storm damage broke our hearts but we will move forward. We must remember that the true beauty of our cemetery is not in the trees, but in our loved ones who are buried here and the good memories we have of them. In December 2017, property was acquired to the east of the existing cemetery for a much-needed addition. In 2019, the expansion is set to begin. We are excited to begin this project. We would also like input from parishioners on possible landscaping. As much as the loss of our big trees devastated us, it does give us the opportunity to merge the old and new sections of the cemetery with similar landscaping throughout.